Breakfast is provided daily at this Port Lavaca area hotel. The Light House Beach Fishing Pier is 1 mile from the hotel. Rooms feature cable TV. 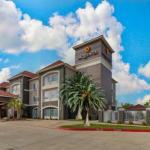 Free Wi-Fi is available in all rooms at the LA Quinta Inn and Suites Port Lavaca. A microwave, small fridge, and coffee-making facilities are included. An outdoor swimming pool and fitness centre are provided at the Port Lavaca La Quinta Inn and Suites. A business centre and a 24-hour reception are featured for guest convenience. Victoria is 40 minutes’ drive away. Calhoun County Museum is 5 minutes’ drive from the hotel..
We plan to add more related stuff like: pet friendly hotels in Port-Lavaca, Texas dog friendly hotels in Port-Lavaca, dog parks in Port-Lavaca, pet stores in Port-Lavaca, TX, and pet spas in Port-Lavaca. Keep checking for more!